Sugar and fresh tamarind give this dish a vibrant mix of sweet and sour flavours. Cook the noodles according to the pack instructions. Drain and divide between 2 bowls. Keep warm. Bring the stock, lemon grass, tamarind and chilli to the boil in a medium-sized saucepan. Add the mushrooms and simmer gently for 5 minutes. Juice half the lime and cut the rest into wedges. Add the tofu, peas, sugar, soy sauce and lime juice to the pan and simmer for 3 minutes, or until the vegetables are soft. 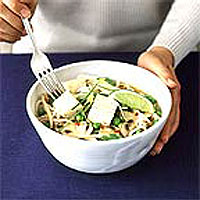 Ladle over the noodles and scatter with salad onions, beansprouts and coriander. Serve immediately with the lime wedges.